On every Outward Bound course our students experience the benefit of relevant challenges and the positive effects of nature as they build character and leadership skills: emotion management, empathy, teamwork, responsibility, initiative, problem solving, persistence, and service. Equally important, our courses provide opportunities to identify personal strengths, collaborate with peers, and create community. These experiences are a touchstone for our students, building competencies and instilling a sense of confidence, gratitude and a zest for life. These life-changing experiences are also touchstones for our instructors and staff. Outward Bound instructors always learn in the field and as a result they take this knowledge and apply it to their own lives and in their communities. Almost a year ago to the date, I had the chance to sit down with one of our instructors and former interns, Yoshie Kateada. 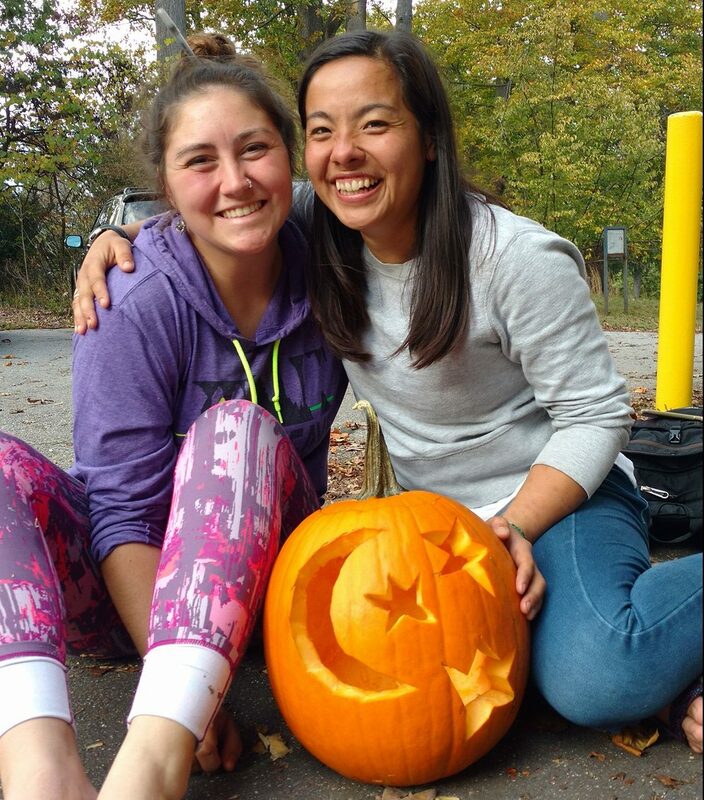 At the time, Yoshie was recapping her experiences as an intern and about to travel out East to work for one of our sister schools, Baltimore Chesapeake Bay Outward Bound School. She was heading out with fellow former intern Katie Dyer. Baltimore and Voyageur have a lot in common, and it’s no surprise that we share and cross train staff. Both schools have an urban base that strives to serve diverse communities in vibrant cities with relevant programming. We are proud of our urban bases, as they tend to lead the way in innovation and inclusion. Programs are often highly customized to suit student and organizational needs and courses are designed to dovetail with the goals and structures of schools and youth serving nonprofits. Instructors who work at our urban bases are motivated by the chance to work with diverse populations of students; these folks lead the way in relevant character development and they consistently support specific social-emotional learning goals. Urban programming lives and breathes the Outward Bound educational model and Baltimore and Voyageur are well known nationally for specializing in middle and high school experiential education. 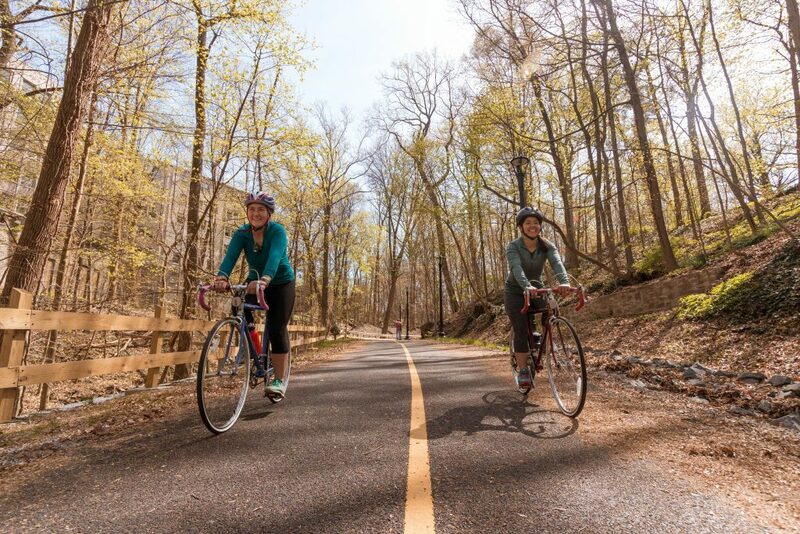 Last week, I sat down with both Yoshie and Katie to hear about their training and experiences across Baltimore and Voyageur, why gratitude and service mean so much to them and why the heck they’re traveling across the country by road bike to promote mental wellness. Yoshie: I could talk about Baltimore forever. Everything was so new at VOBS, including me! It was a whirlwind, exciting! At Baltimore, I started to get my foundation as an instructor. I received a lot of mentorship, got a strong basis for curriculum, and taught lessons multiple times — the way you teach the lesson can be so pivotal for the students. There is such a huge commitment to access in our urban programs. A lot of people ask, “how do you make a day program transformational for students?” The answer is, “We can and we do.” Not everyone can go on a 30-day course. Working at an urban base is such a valuable experience for an instructor. We get to see everything that OB can be and this makes my commitment to OB stronger. Yoshie: I came back to VOBS this year for Winter Instructing in Texas. My first Outward Bound experience was in Texas. Therefore, I have what you might call a “heart-attachment” to the location. I also really love our culture at VOBS. It’s a place where we’re consistently challenging ourselves. Katie and I talk about this a lot. It’s a community that asks for continuous growth and how to become the best version of yourself. It’s a real privilege to work in this environment. I also love the land in Texas. I wasn’t expecting to love the desert, but Big Bend is so special. From mountains, to deserts, to rivers. It feels remote. We’re still discovering parts of that park and I love being a part of that discovery and growth. VOBS is a community that asks for continuous growth and how to become the best version of yourself. It’s a real privilege to work in that environment. Katie: I’m heading back to Homeplace (HP) this winter too. I’m really excited for the professional development and to make sure I don’t become complacent. I’ll be learning a whole new set of skills. For example, I’ve never even been on a dogsled! I’m about to see the environment I love in the summer become a whole new world in winter. I know it will be physically challenging and hard. When it comes to canoeing and portaging, I feel like I’m close to mastering those skills. However, learning a whole new skill set reminds you of your students and what it’s like to struggle and try something new. Some of the relationships I started with summer staff can now continue to build this winter. I’m excited to help HP run and become more involved in the community — to officially make Minnesota home. Instructing: What’s the Biggest Challenge? Yoshie: I was just telling Katie, when it comes to instructing, what I find most challenging and what I love are probably the same. I love that being an instructor means a 24-7 immersive job. It takes all of your attention and takes all of you to do this job. Given that, there’s so much understanding and support in the community around you. Your peers and mentors understand because it’s happening to them too which creates a wonderful culture of support. Going on course puts a spark in their brain; they figure out their trajectory and are given an opportunity to see something else. Most challenging…yeah (Katie trails off with a big sigh). We talk a lot about failure and how it’s okay to feel failure. Nonetheless, sometimes it’s really hard to watch people do hard things and not succeed. On the other hand, Yoshie and I are currently in the middle of this fiasco to ship our bikes across the country (you’ll read more on this below!) We’re packing them ourselves, and dragging them to Tennessee a day later to get shipped. It’s crazy. However, if we never met failure, this moment of accomplishment wouldn’t feel so good!! Yoshie: I can’t choose! But if I have to, it was from Emily Shames at Baltimore. Emily always says, “Outward Bound works.” There’s something about trusting the structure and process. Similar to what Katie was saying earlier, it’s hard to watch students struggle because you want to care for them. But if you take them into the woods and give them this experience, it might not always be what you thought it would be but the outcome will work. People’s lives are in your hands; you’re trying to give them this amazing experience. But really, it’s about handing the experience over to them, and trusting they’ll find what they need. Sometimes you gotta go to know. Katie: Remember to have human conversations. On course, you’re teaching your students all of these technical and OB things, and talking at them a lot. However, it’s important to remember to talk about yourself and learn about them. Talk about video games and what they like to eat and their hopes and dreams. You want to teach them things but even more, you also need to know who they are before they got here. Also, remember to have human conversations with your co-instructors. Why did you come to OB? Do you have siblings? Sometimes you step back and realize I’ve been living in the woods with this person and we’ve only talked about if we’re out of cheese or what the trail looks like tomorrow. Yoshie: The themes “community” and “family” are my favorite parts of course. Because we get to model what a good relationship looks like. You’re out there intensely for a long period of time; it can be hard, but students are smart and pick up on everything. Everyone is in this together and that automatically create a sense of family. One thing I missed as a student when I finished course was the sense of family and community; it’s what brought me back to OB. I can only imagine that for a lot of kids, feeling like you belong can be a very unique experience. Dan Blessing at VOBS said once, “It can be easy to feel like you’re failing… but as long as your students feel love and cared for, that’s success.” There’s a lot that happens on course but if you have love and belonging, that’s the foundation that makes everything else more possible. Katie: I see it as “community” and “compassion.” People have different views on what community or family is. We’re all coming from different places. 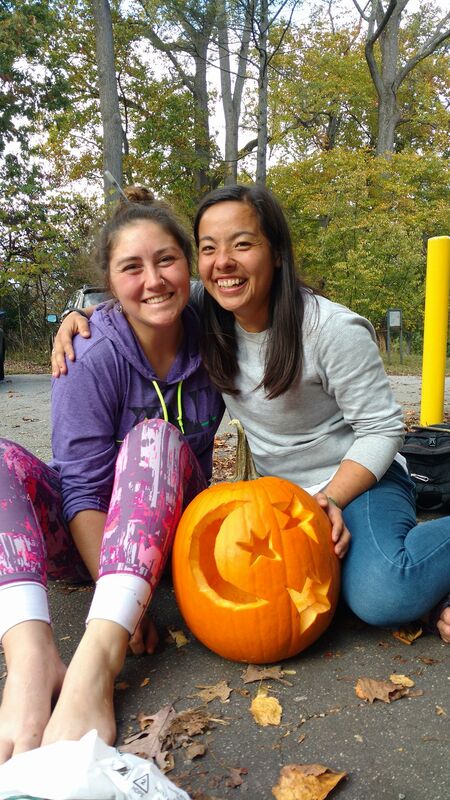 When students come to OB, it’s a community or family they didn’t choose… but they need each other. Whether they want to or not. They’re going to have awesome times as a group and have times of difficulty. Throughout it all, they learn to communicate. Slowly and surely they become one unit with their individual parts. It’s a weird thing. From day one, you’re told, “this is our community for the next three weeks!” You never spend this intense 24-7 time with seven strangers. I haven’t spent this kind of intense time with even my best friends, and here I am with these seven strangers in the woods. Community and family can look a variety of ways; it all gives perspective. Katie: Service is one of my favorite things!! (Katie says over the phone with joyful laughter and excitement.) It’s one of my personal values, and began during my experience with the AmeriCorps programs. Here at OB, I love talking to students about service. I start by asking, “what does service even mean? What does it mean to you?” I’ve gotten every kind of answer from service is the military, or volunteering at a food pantry, voting, or donating blood, to talking to a friend. It’s a whole spectrum. We can do service every day. You might offer to clean up at a park but you’re also showing compassion and helping one another. On course, I like to ask myself and have my students ask, “what can I do right now to make this person’s experience a little better?” Because even filling up someone’s water bottle for them is an act of service. It’s the tiny things that can inspire others to do tiny things too. When all combined, they aren’t so tiny. It creates this web, where everyone connects and creates community. Yoshie: Katie said it so well. Similarly, I am always really impressed with the way OB builds gratitude in students. A lot of students get homesick. As a result, they have a whole new appreciation for family and home in general. Gratitude and service feel very connected to me; it’s the little acts of caring for one another. On course, students often say they can’t wait to go back home and “tell X person what they mean to me.” Being in this environment makes you think about who has your back at home. In terms of the sites we go to for service, farms and food service after course, there’s really cool people and staff working there. It’s great for our students to see people that dedicate their lives to helping. The world would be so much better if more people found their passions and lived what they believed; this is a really cool piece for a course end. 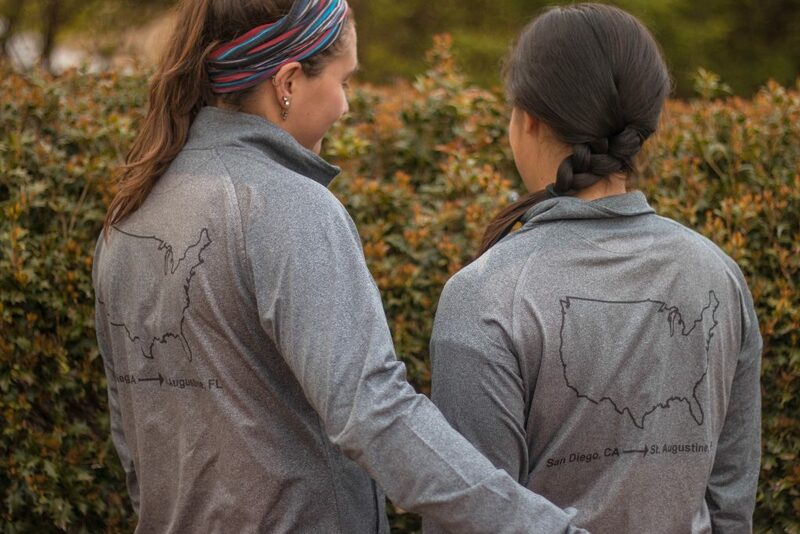 Katie and Yoshie started the organization, Wheels for Mental Wellness and are currently biking from San Diego, CA to St. Augustine, FL. Their cross-country bike trip is raising awareness for Mental Health First Aid. They believe that education gives people the tools to talk about and address mental health issues, empowering the individual to create healthier and more compassionate communities. Katie: I’m not sure I would have done this if I hadn’t come to VOBS. Lisa Pugh, Dan Blessing, and Tyler Fish did presentations at Homeplace on their own adventures and we thought, “THESE PEOPLE ARE SO AWESOME!” We want to take our own personal expedition and personal adventure. We challenge our students to do this on course; now we want to challenge ourselves. Neither of us has been on a road bike… but we thought, so what?! Let’s bike across the country! Outward Bound teaches you to not become complacent, to challenge yourself. It’s important to practice what we preach. We both have family and friend histories with mental health; it’s a big part of our lives. This is a huge thing going on in our world and becoming more and more present in our students. Mental health is hard and uncomfortable for people to talk about. We want to help change that. We are doing this ride because it’s a challenge to ride but it’s also challenging to talk about mental health. Yoshie: We chose to work with Mental Health First Aid because we feel like they give really concrete information and skills. Mental health is a really big and complex issue; they help to break it down and empower individuals. Their goal is to create a more supportive and informed community. Katie: It’s similar to Wilderness Response Training. Their approach is: this is what you do in a crisis, and here are your tools and resources. You may not necessarily be getting certified but this training gives you the foundation to start somewhere. How do you demonstrate that you are actively listening? What are the next steps to guide someone through the process and get them to a better spot? Now it’s on your radar, and you know what to look for. Yoshie: It’s also similar to working with our students. Sometimes we have to say to ourselves, “okay, this is a panic attack, not a heart attack… I know how to address this.” It’s not a long training, and a lot of communities offer it for free. Our goal is to just get as many people trained as possible. In all honesty, I could have talked to these two inspiring and enthusiastic individuals all day. They are a shining example of what it means to push yourself to new levels and do it all with gratitude and selfless service. Their spirit of service is embodied by every Outward Bound instructor I know; this is a pretty special place to work! 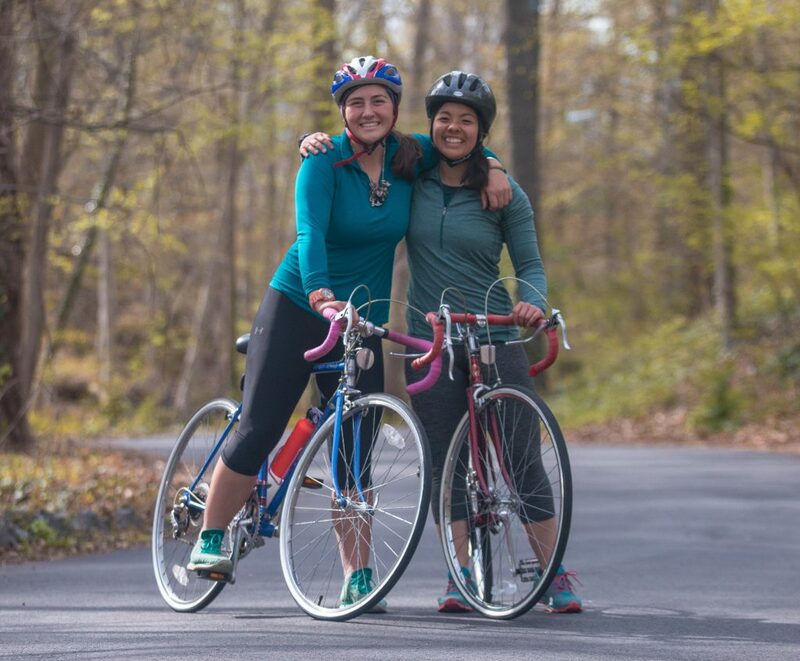 To hit the road with Katie and Yoshie on their biking adventure, follow them on their website or instagram. They took off on September 9th! If you’d like to learn more about becoming an Outward Bound instructor, visit our employee page. 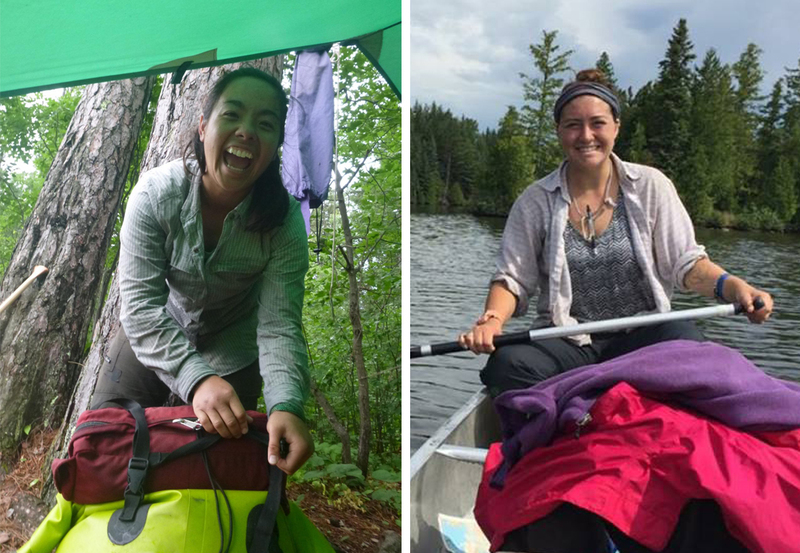 If you’d like to sign up to go on your own Outward Bound adventure, visit our programs page to find the right course for you!